Great Mosque was originally called Masjid Sultan. Laying the first stone in 1738, and the opening on Monday 28th Rabi'ul or 115 H May 26, 1748. 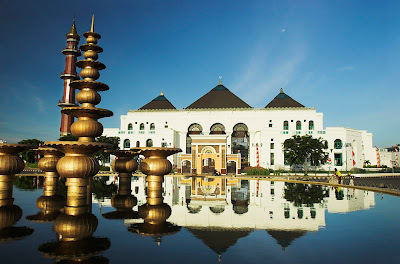 Great Mosque built by Sultan Mahmud Badaruddin I. also known Jayo Wikramo (reigned in 1724-1758). This mosque is a mosque at the time of the most beautiful and largest in the archipelago, with typical architecture of the pyramid roof. The mosque is established in Europe under the supervision of the architect, with most of the material imported from abroad, such as marble and glass. The writers either the complainant or the Dutch and other Europeans admired architecture blend with a touch of typical Chinese architecture and engineering from the West. The sketch above was made by the Dutch painter and is now one of the collection Rijks Archief at The Hague under the name JW van Zanten (1822). 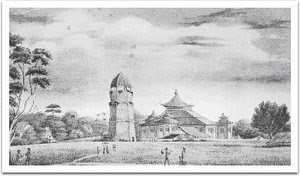 The mosque was painted in disrepair, due to the war-Dutch Palembang 1819 and 1821. This mosque was originally sized 1080 m2 with a capacity crowd of approximately 1,200 people (for circulation 20%). Then since colonial times until the time of independence of the changes and development continue to be held, so that the authenticity of Mosques vanish altogether. 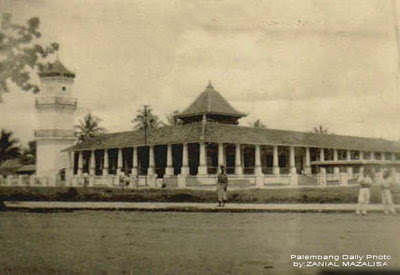 At the beginning of construction (1738-1748), as the old mosques in Indonesia, the Sultan Mosque was originally not have the tower. 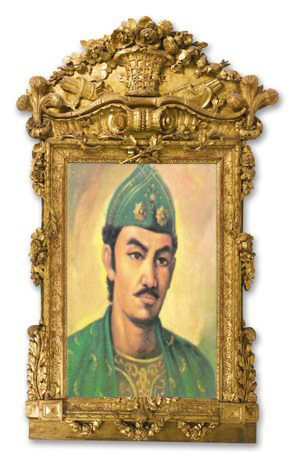 Then in the reign of Sultan Ahmad Najamudin (1758-1774) then built the tower which was situated a little apart in the west. Form of the tower as the tower of the temple buildings with pointed roofs curved shape. On the outside of the body of the tower is fenced patio that surrounds the body. Form of the mosque which is now known as the Great Mosque, not much different as we see now. The present form has experienced many times makeover and expansion. At first the improvement made by the Dutch government after a major war in 1819 and 1821. After the repairs done and then do the addition / expansion in the years 1893, 1916, 1950s, 1970s, and the last in the 1990s. In the renovation and construction work in the 1970s by Pertamina, is also building a tower that reached its present form. Original tower with Chinese-style roof that was not torn down. The second extension of time in 1930. conducted again in 1952 by the expansion of the Great Mosque Foundation in 1966-1969 to build a second floor addition so vast mosque until now 5520 square meters with 7750 seating capacity. 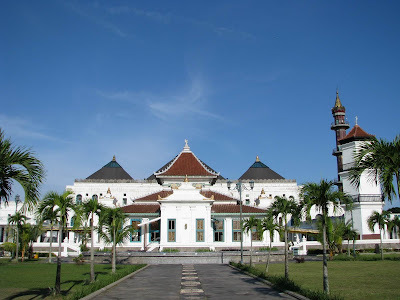 The Great Mosque is an old mosque and very important in the history of Palembang. Mosque about 259 years old was located in Sub-District 19 Ilir, District West Ilir I, right at the junction between Merdeka street and Sudirman street, the central city of Palembang. 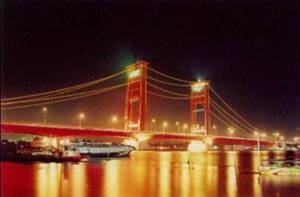 Not far from there, there Ampera Bridge. Mosque and the bridge has become a land mark the city until now. In history, the mosque is located in the center of the kingdom was the center of Islamic studies who gave birth to a number of important scholars of his time. Sheikh Abdus Samad al-Palembani, Kms Fachruddin, and Syihabuddin bin Abdullah are some scholars who are in the mosque and has an important role in the Islamic discourse and praxis. Sultan Mahmud Badaruddin I (Jayo Wikramo) laying the first stone of the founders of the Great Mosque in 1 Jumadil End 1151 H (= 1738 AD). The building was standing behind Kuto Besak, Sultan's Palace which was once situated on an island surrounded by the Musi River, Sekanak River, Tengkuruk River, and Kapuran River. The first phase of construction took place from 1738 until 1748. At first mosque was established without the tower. Sultan Najamuddin I, son of Sultan Mahmud Badaruddin I, then build a tower on the right front, the hexagon-shaped about 20 meters tall. Mosque which has a unique architecture with its pyramid roof of this, said to be the largest mosque in the archipelago at the time. The architect of Europe and some building materials like marble and glass is imported from outside the archipelago. At that time the area is the European marble exporter. From the drawing, the roof of this mosque nuanced pyramid of China by the end of the roof curved up. Thus, the mosque's building architecture is a combination of Europe and China. Mosque figure quite prominently today in the middle of the city of Palembang's increasingly crowded and chaotic. Mosque square and the main building with three steps to the top or pyramid-shaped mustaka. The third step is to have some kind of top level neck decorated with floral carvings. At the peak there mustaka mustika shaped flowers bloom. 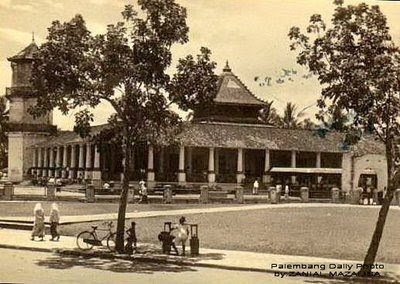 Form of the railroad was influenced by the basic form of Hindu-Javanese temple, which is then absorbed the Great Mosque of Demak was founded trusted Wali Songo, spreaders of Islam in Java. On top of the pyramid there are bunch of leaves or vanity SIMBAR resembles a curved goat's horn, as many as 13 each side. Jurai gold colored curved shape and sharp. No doubt, the basic form that resembles jurai pagoda roof. Window mosque built big and tall, while pole mosque built sturdy and large. These options generally give the impression like the European architecture. Hollywood was also found in many buildings Indies, which was made during the Dutch colonized Indonesia eighteenth century until the early twentieth century. First Mosque building nearly the size of four square-shaped 30 x 36 m. The fourth side of this building there are four performances that served as the entrance, except that the western dibagian sanctuary. The roof-shaped roof tumpung, consists of three levels that symbolizes religious philosophy, is the influence berundak roof of the temple. The materials used are ex-class materials imported from Europe. Difficult to bring building materials, then this job long enough and be in the New Mosque inaugurated in early Jumadil 28 Date 1161 H or M. May 26, 1748 At the beginning of this mosque has no minaret, then in 1753 created the tile-roofed towers and in 1821 to replace the shingle roof and the addition of a high tower equipped with a circular porch. After 100 years of mosque establishment in 1848 expansion plans held by the colonial government before the expansion of the transformation of the gate is held in the foyer of the traditional form of a Doric forms. In 1879 the mosque has held changes, the expansion of the foyer entrance into the loading plus an open porch with columns that Benton round or shaped like Pendopo like this colonial-style building is the first expansion and the addition of design and in 1874 reported beruba form of the original tower and year 1916 the tower was completed again. In the year 1930 held that changes in the distance add columns to 4 m from the roof. After independence in 1952 is the third expansion of the form that is no longer in harmony with the original with the added the dome. great mosque trustees 1966 -1979 continued addition of a room by adding a 2nd floor building was completed in 1969. On 22 January 1970 Development begins a new tower with a height of 45 meters, sided. Funded 12 Pertamina and the launch on February 1, 1971. Since the year 2000 this Mosque in renovation and completed on June 16, 2003 which was inaugurated by President Hj. Megawati Soekarno Putri. 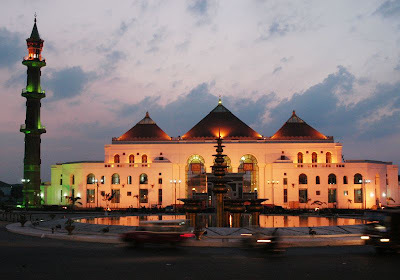 Architecture of the Great Mosque and a few old mosque in Palembang offers forms of symbolic. Steps in the courtyard and the roof of the mosque, for example, symbolizes the congregation or the human journey to draw closer to God. The first level is the controlling stage of sharia or charitable good deeds, in accordance with the religion. The second level reflects the nature or process of soul searching stored behind the visible actions. The third phase of the peak travel for humans has been ma'rifat, knowing the nature of God. Form the steps humans always invited to hone themselves with discipline actions, reaching significance, and know God. Stages of the spiritual journey that is endless.